Quality of supply has been one of the main aspects covered by the European Energy Policy in the last decades together with the competitiveness and the sustainability. Several regulatory actions have been taken in this regard and have been applied at European level. Most of Energy National Regulatory Agencies have implemented electricity distribution network retribution mechanisms based on the quality of supply provided by the companies responsible for that. These measures were mainly based on the technical quality: number and length of service interruptions. However, electricity consumer satisfaction has not been measured for checking how commercial quality is affecting it. In this working paper, technical and commercial quality of supply indicators for household electricity consumers in Spain are assessed together by means of an statistic model. The impact of commercial quality will allow us to identify possible policy recommendations to be implemented in the regulatory framework. 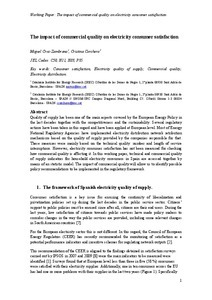 Cruz, M.; Corchero, C. The impact of commercial quality on electricity consumer satisfaction. A: Congreso de la Asociación Española para la Economía Energética. "VIII Congreso Asociación Española para la Economia Energética". València: 2013, p. 1-12.